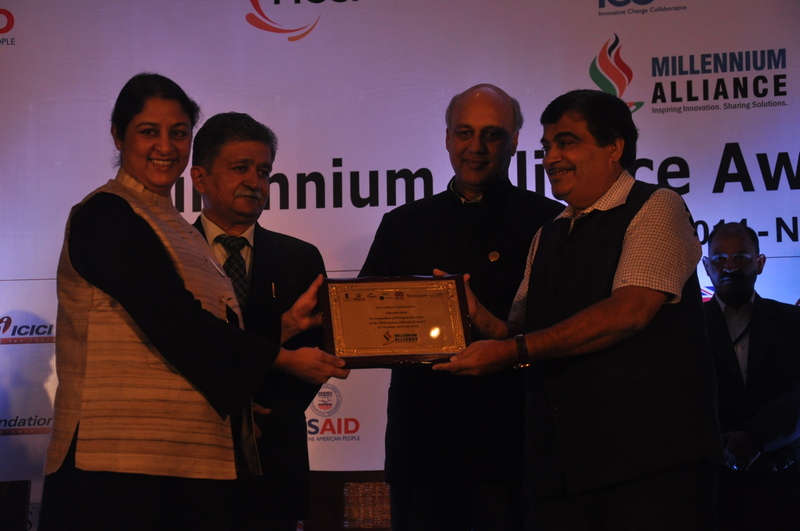 Safeena Husain, Executive Director & Founder of Educate Girls, receives the Millennium Alliance Award from Nitin Gadkari, Union Minister of the Ministry of Road Transport & Highways and Shipping, Govt. of India. This week, our founder and Executive Director, Safeena Husain, attended the Millennium Alliance Awards Ceremony in New Delhi. 20 Award Winning organizations, including Educate Girls, were felicitated by Nitin Gadkari, Union Minister of the Ministry of Road Transport & Highways and Shipping, Govt. of India. The winning organizations were selected through a rigorous selection and evaluation process of over 1,400 proposals received as a result of pan-India outreach supported through 40 roadshows across cities. The ceremony was organized by FICCI in association with Technology Development Board (Department of Science and Technology, Government of India), United States Agency for International Development (USAID), Department for International Development (DFID) of UK, ICCO Cooperation, ICICI Foundation for Inclusive Growth and Wadhwani Initiative for Sustainable Health (WISH). The Millennium Alliance is an inclusive and diverse platform to leverage Indian creativity, expertise and resources. They identify, support, and scale innovative solutions being developed and tested in India to address development challenges that will benefit low-income populations across India and the world.